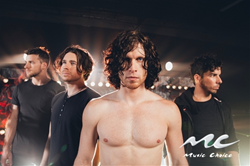 Nothing More featured in Music Choice's Artist To Watch program this month. Nothing More’s Jonny Hawkins stated: "It’s awesome to have been chosen to be Music Choice’s ARTISTS TO WATCH for the month of September. We are excited for the world to hear our new album, and hope you like this playlist we made just for you. Thanks Music Choice!" The Artists To Watch Playlist is a unique opportunity for emerging artists to be featured across all Music Choice properties. Each month, Music Choice will highlight four- five emerging artists across genres to promote the playlist handpicked by the Music Choice Programming Team. Artist’s videos will receive top-level folder placement On Demand, airplay on their respective music and video channel and artist curated takeovers on weekends. Fans are encouraged to support their favorite artists by watching videos in the playlist and sharing with their friends on social media. They are also encouraged to tune in each weekend for Music Channel and Video Channel takeovers. San Antonio-based rock quartet Nothing More will release their new album The Stories We Tell Ourselves on September 15th via Better Noise Records. The follow up to the band’s self-titled 2014 breakout LP, The Stories We Tell Ourselves sees the band broadening sonic horizons while mining the dark internal spaces for inspiration. It includes lead single “Go To War,” which debuted as the fastest growing song at Rock Radio and is currently in the Top 10 at Active Rock. The track is also featured in the summer blockbuster War for the Planet of the Apes trailer. Other released tracks from the LP include “Let ‘em Burn,” “Just Say When,” and “Who We Are.” Supporting the LP release, Nothing More will embark on The Noise Presents Nothing More: The Stories We Tell Ourselves Tour 2017. The album is available for pre-order now at all digital retailers along with exclusive merch packages, signed vinyl and CDs at PledgeMusic.